NASTAR medals are earned within age and gender groups. Check the handicap chart to see the handicap needed to win your desired medal. Each time you race NASTAR you could win a Platinum, Gold, Silver or Bronze medal depending on the handicap you earn in your age & gender category. 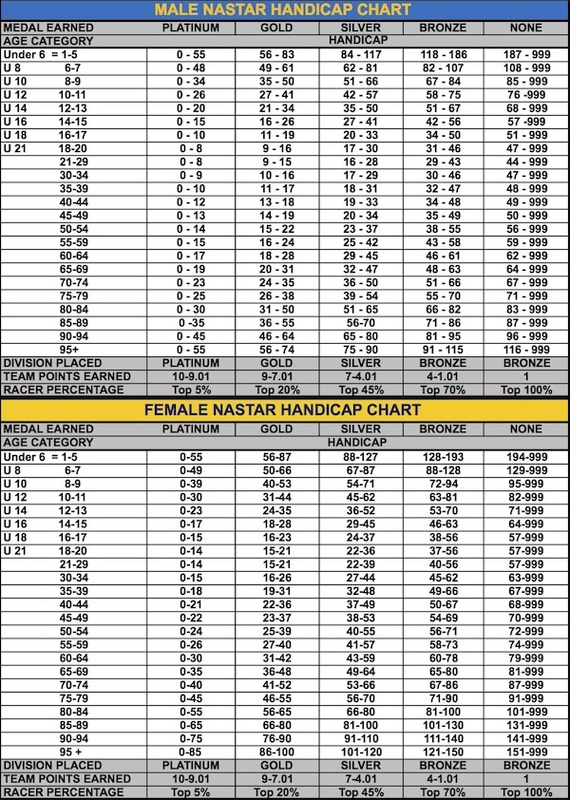 The NASTAR Handicap Chart shows the handicap needed in each age & gender category to win a particular medal. Medals are awarded to participants in accordance with official NASTAR scoring regulations at the time of the race. Each resort should have a supply of NASTAR medals on hand and is in charge of distributing medals to participants. Typically resorts distribute medals at the finish area and/or at a base lodge. Participants are encouraged to confirm this location at the time of the race. The hosting resort is the only place you can get a resort-specific NASTAR medal. Unfortunately, NASTAR does not have a supply of resort-specific medals on hand. If you misplaced your medal or never received your medal from the resort you must contact the resort directly.